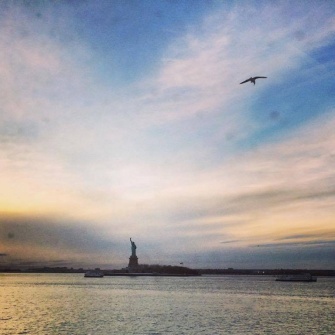 BOTTOM LINE: A site-specific podcast-play on the Staten Island Ferry asks each listener to take in the gorgeous views as well as your fellow passengers. Most shows in the 2015 Fringe Festival take place in unique locations. Many occupy traditional, yet scrappy, theatre spaces, but the prize for most unconventional venue belongs to Ferry Play, which literally brings audiences onto the Staten Island Ferry, and reimagines what it means to be a site-specific theatre piece. In Ferry Play, the Staten Island Ferry is not only the location and the setting of the play, it is also a character—and so are you and everyone else on board this floating orange vessel. Ferry Play is best described as an audio-sensorial-site-specific-play. For $1.99 anyone can download the “Ferry Play” app on an android or iPhone and board the free ship that takes passengers to and from New York City’s fifth borough. Conceived and directed by Erin B. Mee with text by Jessie Bear, this podcast-play (podplay?) is broken up into two parts: Act One (your ride from Manhattan to Staten Island) and Act Two (the trip back). The Ferry Play app instructs you where to begin each act, and once the boat pulls away from the docs, all you have to do is pop in your headphones, press play, and listen. One hears imagined conversations from passengers on board, bits of history, and stories from some of the 75,000 people shuttled back and forth everyday. Throughout the experiential “play” the listener is asked to take stock of their surroundings: the ship, the water, the passengers, and one’s self. We are audience and participator rolled into one. What makes Ferry Play such a compelling idea is that typically theatre asks the audience to turn off the phone and pay attention to the events onstage. Ferry Play asks us to pay attention in a place were one ordinarily zones out. There are no characters with whom we can connect here, but there are real people, going about their daily lives, and Ferry Play asks the listener to pause, and consider our neighbor, ourselves, and decide where we fit into this urban narrative.